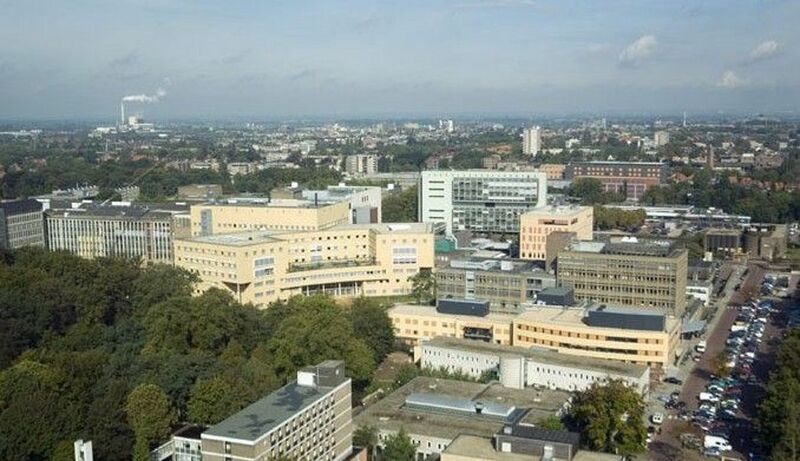 The Department of Human Genetics was founded in 1971, and re-organised in 1983 when prof. dr. Hans-Hilger Ropers was appointed as the new head. Since 1998, prof. dr. Han G. Brunner is head of the Department. The Department of Human Genetics provides the best possible care for patients and families with hereditary diseases. The department also performs groundbreaking research into the relationship between genes and diseases, notably concerning blindness and deafness, cancer, congenital anomalies, and mental handicaps. 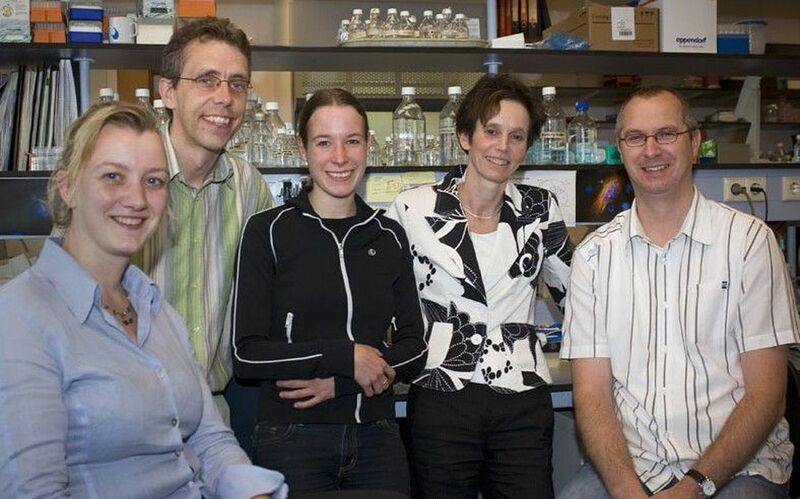 The Department of Human Genetics (www.humangenetics.nl) has ~230 employees and consists of four divisions, i.e. Clinical Genetics (head: prof. dr. B. Hamel), Cytogenetics (head: prof. dr. A. Geurts van Kessel), DNA Diagnostics (head: dr. H. Scheffer), and Molecular Genetics (head: prof. dr. F.P.M. Cremers). 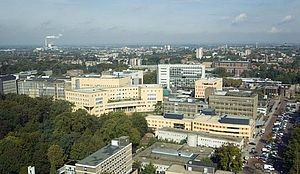 The department is part of the Nijmegen Centre for Molecular Life Sciences graduate school. Prof. dr. A. Geurts van Kessel focusses on the role of chromosomal aberrations and related molecular defects in the development of familial and non-familial forms of cancer, with primary focus on urogenital carcinomas and bone- and soft tissue sarcomas. Dr. H. van Bokhoven aims to resolve the molecular basis of syndromes (e.g. EEC-, Robinow-, Feingold-, and Walker-Warburg syndrome) with abnormal brain development and malformations of the limbs, which culminated in the identification a number of genes that are crucial in normal developmental programs (e.g. ROR2, MYCN, TP63). Dr. J. Veltman has pioneered microarray-based genomic copy number profiling and its application to the study of human developmental disorders. His group has been the first to introduce this microarray approach in a routine clinical setting and to use this approach succesfully in gene-identification studies. Array-CGH studies led to the identification of the CHARGE syndrome gene (CHD7) by mrs. L. Visser. Drs. 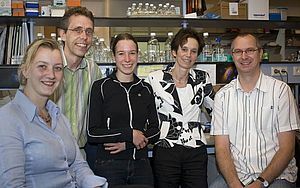 H. van Bokhoven, B. de Vries and B. Hamel study the molecular causes of mental retardation. They collaborate with several internationally renowned groups (see: www.euromrx.com) which together identified 17 of the 25 genes for non-syndromic X-linked MR that are known to date. In addition, they found that loss-of-function mutations in Eu-HMTase1 as the cause of a common and severe mental retardation syndrome. Under the supervision of drs. H-H. Ropers and B. Wieringa, dr. F.P.M. Cremers initiated research into the molecular causes of sensory disorders in 1987 when the search for the X-linked choroideremia gene got a boost with the identification of submicroscopic deletions. In 1990, the choroideremia (CHM) gene was the first blindness gene to be identified by positional cloning. Similarly, the group of dr. Cremers identified the first deafness gene by positional cloning (X-linked deafness type 3; POU3F4) in 1995. Through great efforts of drs. R. Roepman and W. Berger, the X-linked Norrie disease gene (NDP) and retinitis pigmentosa type 3 gene (RPGR), were cloned. Mutations in RPGR underlie 70% of all X-linked RP. In the last 10 years, the research focus shifted to non X-chromosomal blinding conditions. In collaboration with drs. C. Hoyng and J. Klevering from the Department of Ophthalmology, mrs. dr. A. Maugeri found that the Stargardt disease gene ABCA4 was the major gene implicated in cone-rod dystrophy (CRD) and a minor cause for retinitis pigmentosa (RP). Mrs. dr. A.I. den Hollander successfully identified three of 11 genes for Leber congenital amaurosis (LCA), i.e. CRB1, CEP290, and LCA5, that together comprise 35% of all causes of LCA. These studies were carried out in close collaboration with drs. A. Bergen (Amsterdam), R. Koenekoop (Montreal), and C. Inglehearn (Leeds), respectively. E. van Wijk and mrs. dr. H. Kremer identified a second isoform for the Usher syndrome 2A protein, encoded by 51 additional exons next to the 21 previously identified exons of USH2A. This finding not only had a major impact on the molecular genetic analysis of Usher syndrome patients, but also has led to a reappraisal of the putative function of the USH2A protein. In collaboration with drs. N. Boonstra (Zeist), E. van Nouhuijs (Nijmegen), M. Tilanus (Dept. Ophthalmology, Nijmegen), and L. Hoefsloot, and partially financed by the EU (see: www.euro-ret.net), we are studying the molecular causes underlying vitreoretinopathies such as Wagner disease, rhegmatogenous retinal detachment (RRD), and familial exudative vitreoretinopathy. We identified that splicing defects of CSPG2/Versican underlie a novel molecular mechanism for Wagner disease, and are searching for novel RRD defects in and near the COL2A1 gene. In collaboration with the groups of drs. U. Wolfrum (Mainz), M. Ueffing (Munnich), and I. Glass (Seattle), drs. R. Roepman, H. Kremer, and N. Knoers, investigate protein-protein interactions in the eye, inner ear, and kidney, with a special emphasis on ciliary structures that are conserved between these organs. RPGR, mutated in X-linked RP, and its interactor RPGRIP1, turn out to be located at or near the connecting cilium of photoreceptor cells. RPGRIP1 mutations were shown to cause LCA. Protein-protein interaction studies also identified a homologue of RPGRIP1, RPGRIP1L, which mrs. H. Arts recently has shown to be mutated in a complex blinding condition, Joubert syndrome. The CEP290 and LCA5 proteins also are located in the connecting cilium. These studies are supported by the EU (see: www.evi-genoret.org). Usher syndrome proteins localize in different positions of the retina, among which the connecting cilium. The USH2A protein was linked to Harmonin, encoded by the USH1C gene, thereby establishing a molecular link between USH1 and USH2 proteins. The identification of many of the major genes underlying retinal diseases and Usher syndrome have facilitated the development of cost-effective mutation screening tools. 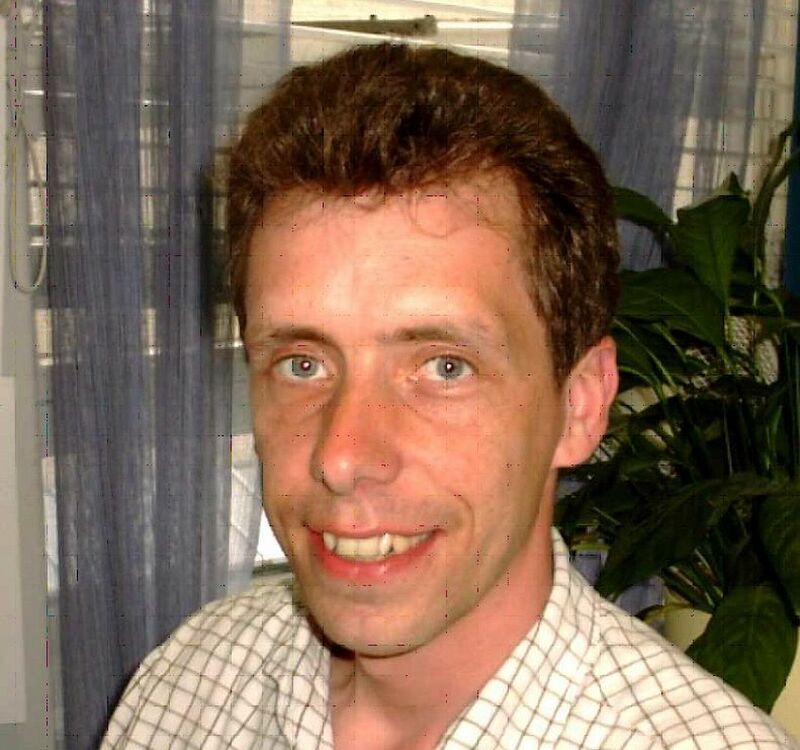 In collaboration with prof. dr. R. Allikmets (New York) and Asper Ophthalmics (www.asperophthalmics.com), high-throughput screening tools were developed for Stargardt disease, CRD, LCA, and RP. Prof. dr. F.P.M. Cremers and mrs. dr. H. Kremer developed a microarray mutation screening tool for Usher syndrome. Technological developments in genetics and proteomics have opened new avenues for research. Microarray technology enables high-throughput genetic mapping of genetic defects and novel sequencing techniques will revolutionarize mutation detection. These techniques will also allow a more effective study of complex diseases such as age-related macular degeneration and glaucoma, which should reveal novel insights into non-genetic factors that contribute to these diseases and hopefully, can lead to their prevention.